RUTLAND—White Memorial Park in Rutland City will debut its two new pools with a community opening from noon to 8 p.m. on Thursday, June 21 and Friday , June, 22, followed by a gala celebration from 11 a.m. to 8 p.m. on June 23. The Saturday festivities begin with an 11 a.m. ribbon cutting ceremony and will include live music and a DJ, face-painting, fresh popcorn, Italian ice, hot dogs, and fun for friends and families! Rutland Recreation and Parks Department (RRPD) Superintendent Kim Peters, who has an aquatics background and previously worked as the recreation director for the town of Killington, said both pools are heated and open to the public. City residents pay a nominal day or season usage fee with rates for kids, adults, and seniors, while non-residents pay slightly higher fees. Renditions of the pool area show the pools in addition to bath houses. The new six-lane, 75-foot competition pool will accommodate lap swimming, adult lap swims, open swims, and the Rutland Swim Team, which welcomes swimmers age 5-19. There is a diving board at the deep end and enough room to accommodate a lap lane during most public swim times, Peters noted. The family pool (for all ages) features a zero entry pool (a gradual slope into the water), a small slide, spray features, and splash buckets. The family pool offers an open swim from 11 a.m. to 8 p.m. and has an area that can be roped off for swim lessons. White Memorial Park also features a children’s playground, five tennis and two basketball courts, a regulation sized baseball diamond, flower gardens, walking paths, and picnic tables. The 12-acre park is named for Mrs. Frances White, who in 1954 provided over $124,000 for recreation and a city park; White’s opened in 1961. 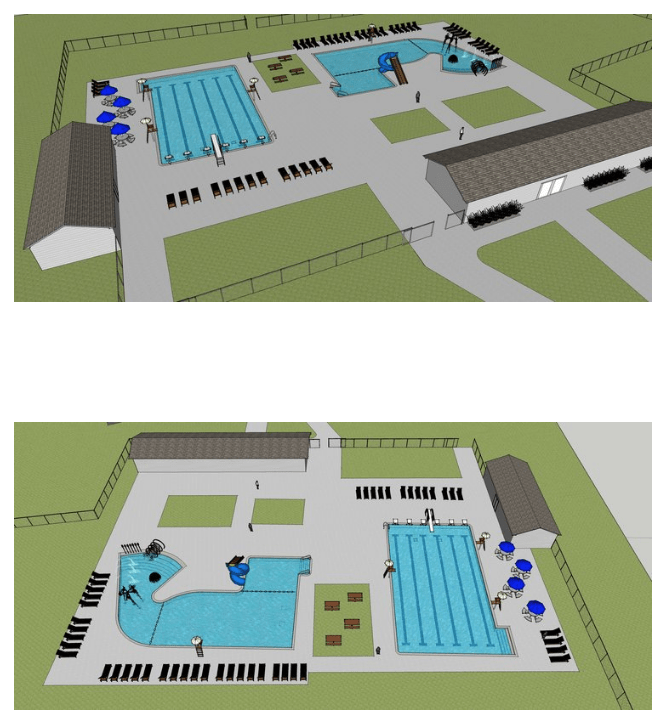 Completion of the new pools means nine weeks of summer day camps return to White’s for ages 5-12 plus half-day and full-day sessions are offered for preschoolers ages 3-5, creating more employment opportunities for lifeguards and camp counselors, Peters said. The original White’s 50-meter pool opened July 20, 1970, and closed after summer 2014. (The pool and bathhouse complex had cost $189,520 when constructed in 1969-70, ($1.28 million in 2018 dollars) and the project received federal as well as state and local funding at that time. After 45 seasons, White’s pool was leaking badly and, having outlived a useful life of 40 years for pools built in the 1970s, officials decided to replace the pool and bathhouse. However, construction bids came in $1 million over budget. That led to design alterations including a smaller slide for the family pool and elimination of a new bathhouse. Russell Construction Services then offered the city a bid it was able to accept. “There’s been a rich history of support for a municipal pool that dates back to the (former) North Main Street pool,” noted Rutland Recreation and Parks Director Bob Peterson. That pool (1929-1974) leaked badly its last five years and stayed open longer than it probably should have because people hated to see it go, he said. That same spirit of support resulted in the new pool at White’s in 1970 and now the replacement pools in 2018, Peterson noted with pride in the enthusiasm shown for recreation in Rutland. Peterson credited that the pools’ on-time debut as the result of “great cooperation throughout the project. It’s been a collective effort and Russell’s flexibility allowed our [parks department] workforce to participate as needed. Bob Cunningham [job superintendent for Russell] and Todd Davis [project manager] were great to work with, and we appreciate their enthusiasm for the project,” Peterson added. Various workers removed the old pool, built the new pools, and installed all new mechanicals in the pumphouse, which holds an amazing amalgamation of two sets of state-of-the-art electronics, filters, pumps, piping and chlorine tanks — one set for each pool. Peterson noted that parks staff have taken a pool operator’s course and are certified to maintain the proper water chemistry and can even monitor the pumphouse’s new equipment via smartphone. With good weather the project progressed on schedule and on budget, so contingency funds were able to be used to renovate the bathhouse. Ed Clark and staff of NBF Architects drew up the plans for a redesigned bathhouse, which features a new layout with a center entrance plus changing and restrooms and a meeting room. With cooperative spring weather, the pools’ concrete decks, tile work, and installation of accessories were able to be completed and the new fencing and landscaping were done, enabling the pools to meet the hoped for June debut. Davis noted it was “a pleasure to work with the Rec Department,” echoing Peterson’s appreciation for the collaborative effort that has brought Rutland City another facility that the community — and region —can be proud of and enjoy. For more information about White Memorial Park, pool hours, or summer activities visit rutlandrec.com or call 773-1822. White’s Pool in Rutland is newly designed. It is opening this week and will offer nine weeks of summer day camps.